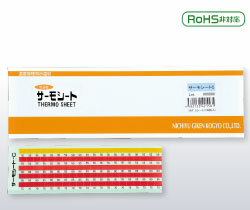 Sheets with a combination of reversible temperature indicating materials. There are two types: 2-temperature and 5-temperature. The 2-temperature sheet is suitable for indicating warning and danger temperatures. (P5·7)The 5-temperature sheet is suitable for measuring temperature and checking for temperature increases. (C) Color-change temperatures and color-change tones are the same as for Number Thermo WappenTM.